These guys offer something a bit different to the upmarket boxing gyms popping up at the moment. All the classes are run by ex-professional and amateur boxers with over 100 competitive fights under their belts, or reformed offenders who have learned boxing the hard way. The Fitzroy Lodge in Lambeth is one of the oldest boxing gyms in London, and, with soldiers from the special forces, ex-pros and elite athletes going at it right beside you, that’s a vote of legitimacy if ever there was one. They’ve got a second site at Carney’s Community in Battersea, which aims to reduce offending, reoffending and anti-social behaviour by empowering young people and improving community cohesion through the ‘power of boxing’. Find out more and book classes here. If boxing’s not quite for you, but you still want a heavy workout, consider The Hard Yard. 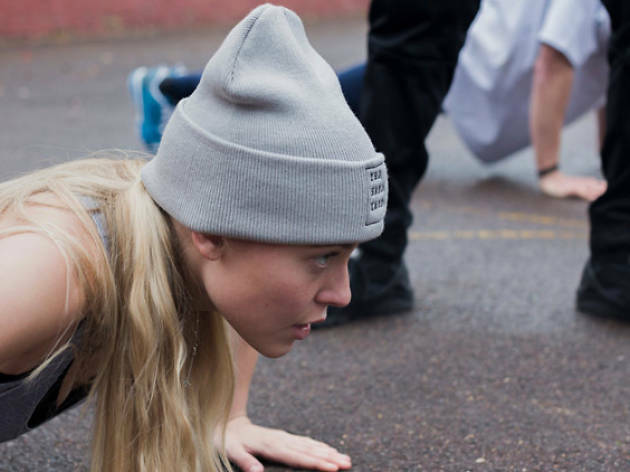 They champion simple workouts in urban gritty settings with no equipment, and add a splash of hip hop. Gangster calisthenics under railway arches? It’s much better than that. You’ll be trained by ex-cons who learned their trade and sculpted their physiques in the limited confines of a cell, without equipment. Their methods focus on positive and permanent life choices, the power of your own body weight and lots of serious hard work. A great one for people put off by gym gimmicks and oppressive equipment. Should you fancy a slightly different pace altogether, head to Supply Yoga in Hackney. The studio hasn’t been open long but this balanced, accessible and relatively cheap (£8.50 a go) class is already doing good in the community. Designed to be non-threatening and not too fitness or spirituality-centric, Supply is geared toward regular people who simply want to leave feeling good. They use the profits to fund free yoga for community support services across east London, for people who otherwise would have limited access to fitness classes. Founder Abi Nolan has worked with cancer support, NHS mental health and housing services as well as with survivors of gender-based violence. The more people that come to class, the more impact Supply can have. Want more downward-facing dog? Check out our London guide to yoga. The Good Gym are another 'good' addition to this list. A run with a mission.